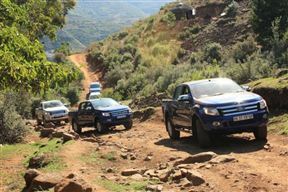 Maliba Lodge 4x4 Trail is situated in the Tsehlanyane National Park in Lesotho. It has a 2 to 3 difficulty grading and is suitable for 4x4 and 2x4 vehicles. The drives range from one to four hours. These are self-drive and all-year-round entrance trails. Accommodation can be found at Maliba Mountain Lodge and Maliba River Lodge. Maliba Lodge 4x4 Trail is 18km from the centre of Butha-Buthe , the nearest airport 113.2km (Moshoeshoe I International Airport).